So, who’s getting excited for the second half of the trailer coming in just a few hours? I know I am! And, just like last week, there will be a podcast episode covering it. I can’t promise when it will be up, but hopefully very soon, and definitely by this weekend. I will, of course, share the video on the TOMP Facebook page though, so feel free to stop by there to comment! To keep us entertained in the mean time, I thought I’d take another look back at the first season. In the first installment of the series, I managed to at least mention many of the key events in the first episode, but it was never really my intention to cover each episode. There are some episodes I might skip altogether and others that will get more coverage. 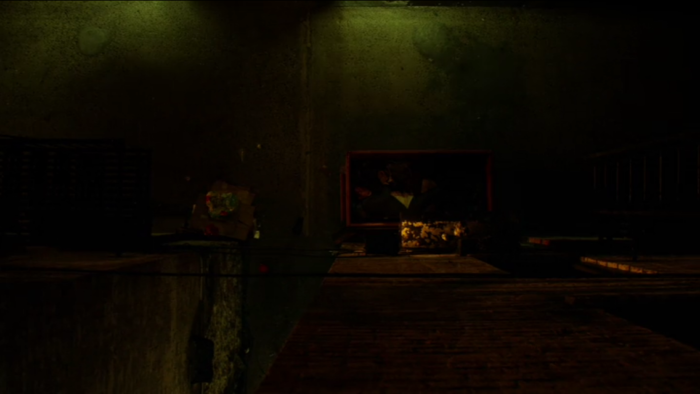 For this post, I wanted to just briefly look at the scene towards the end of episode 2, “Cut Man,” when Matt and Claire torture a Russian mobster, and Matt then tosses him off the roof and into a dumpster on the street below. What makes this scene worth mentioning? Well, for many of the same reasons I picked the scene of Matt in confession for my previous post. It is one of the scenes that, when you look back on it later, clearly shows where Matt started and the amount of progress that took place over the course of this character’s story arc. It is particularly interesting to compare the slightly more disciplined Daredevil, that I expect we’ll see at the beginning of the next season, with the Punisher when you realize that Matt initially didn’t seem particularly bothered by the fact that he might kill someone. Even halfway through the first season, he is still struggling with whether he should actually kill the Kingpin. You might argue that the Russian who ended up in the dumpster did live to tell about it – and that Matt obviously knew that the dumpster was there – but this is still an example of some incredibly reckless behavior. Dumpster or no dumpster, there is no way that Matt could have made sure that the man he just let drop from a roof wouldn’t sustain life-threatening injuries. Applying some comic book logic, you could argue that Matt would just know, but he isn’t excercising any great care when handling the villain in question, and is clearly in a state of rage. Even more damning is the fact that he has to listen to double-check that the man is still alive when Claire asks him. Matt’s obvious disregard for human life in this scene (even when we can all agree that we’re dealing with human scum) is interesting to ponder going into season two. That’s all for now, but before I let you go, I just want to recommend that you check out Marvel.com’s interviews with Charlie Cox, Jon Bernthal, Deborah Ann Woll & Elden Henson, and Elodie Yung (and Elektra’s motion poster is to die for, by the way). And, you may have noticed that reviews are starting to pop up, courtesy of the various media outlets that have been allowed to watch the first seven episodes. I will personally try to stay away from them, but I found this one to be relatively spoiler free, in case you’re interested.